GeriAthletes, seniors who are competitive athletes, require specialized training to combat the natural issues that come with aging. Advanced water therapy has proven to be one of the modalities best-suited for this niche market, and HydroWorx is presenting a March 8, 2016, webinar on this topic for all interested participants. During this webinar, Studer will discuss his strategies for creating individualized aquatic programs for senior athletes. There are few statistics available related to GeriAthletes, seniors who continue to take their athleticism to competitive levels as they age. Despite that fact, physical therapists who work with individuals ages 65+ who compete in foot races, triathlons and similar events know that GeriAthletics is a growing, and necessary, field. To help professionals interested in learning how to train GeriAthletes using underwater modalities, HydroWorx is offering a one-hour webinar led by Mike Studer, PT, MHS, NCS, CEEAA, CWT, CSST, president and co-owner of Northwest Rehabilitation Associates. The event, “GeriAthletics: Training Competitive Athletes Over 65 Years of Age with Higher Intensities Underwater”, will be held on March 8, 2016, from 1-2 p.m. E.S.T. During this webinar, Studer will discuss his strategies for creating individualized aquatic programs for senior athletes. Studer’s expertise in this area has been honed through his research on how Olympic, professional and collegiate athletes are currently using water to safely build and/or maintain their abilities without risking overuse or overtraining injuries. Additionally, “GeriAthletics: Training Competitive Athletes Over 65 Years of Age with Higher Intensities Underwater” will focus on ideas to market and implement aquatic exercise programs to GeriAthletes. As a bonus, Studer will share his experiences with third party reimbursement, private pay, consultation and capitated contractor models. At the conclusion of the webinar, Studer will lead a 15-20 minute question and answer session. Registration for this free HydroWorx webinar can be made online prior to the start date and time at http://ww2.hydroworx.com/webinar-geriathletics. Mike Studer has worked in the field of physical therapy since earning his degree from the University of Missouri-Columbia in 1991. He also holds a post-professional MHS degree from the University of Indianapolis, is board-certified as a Clinical Specialist in Neurologic Physical Therapy and is designated a Certified Exercise Expert in the Aging Adult (CEEAA) by the Geriatric Section of APTA. Now the founder of Northwest Rehabilitation Associates of Oregon, Struder is recognized as a leader in the physical therapy marketplace and frequently lectures on topics including GeriAthletics. 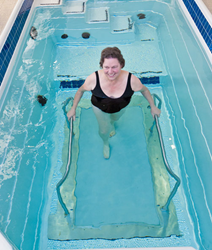 Since the late 1990s, HydroWorx has manufactured aquatic therapy pools with integrated underwater treadmills to enable rehabilitation professionals to more effectively offer their patients the opportunity to increase range of motion, decrease risk of falls and joint stress, and remain motivated through the rehab process. Products such as the HydroWorx 2000 and 500 Series therapy pools, along with the new HydroWorx 300 system have revolutionized the face of aquatic therapy; in fact, HydroWorx technology is used by world-class facilities such as OrthoCarolina, Cleveland Clinic, Kennedy Krieger Institute, Genesis Healthcare, Neuroworx, Clear Choice Healthcare, PruittHealth, Premier Rehab, Leg Up Farm and many other healthcare facilities across the country. HydroWorx offers a wide range of underwater treadmill pools and peripheral products and services. Every day, more than 24,000 athletes and patients use HydroWorx technology to recover from injuries and health conditions. More information about HydroWorx can be found at http://www.HydroWorx.com.